Chinese papers discuss China-North Korea ties, while criticising the "tyranny" of pro-democracy protesters in Hong Kong. According to reports, North and South Koreas naval patrol boats briefly exchanged fire on Tuesday near their disputed Yellow Sea border. The incident came as hopes had been raised of a constructive reboot in strained inter-Korean relations following the surprise visit of a top-ranking North Korean delegation to the South just three days before. Suspicious of North Korea's "flip flop attitude" and its motives, an article in the Beijing News reminds that one should observe North Korea's actions instead of its words as Pyongyang's foreign policy is "usually inconsistent". "Because of the lack of integrity, its [North Korea's] verbal statements are not going to convince any country… It tried to gain attention by planning the top official's visit to Seoul, however, this is meaningless as the most important question is whether Pyongyang will give up its nuclear programme," it says, adding that Beijing has repeatedly urged Pyongyang to abandon its nuclear programme. Jin Qiangyi, an international affairs expert at Yanbian University, tells the Global Times that "China is unlikely to offer strong support to North Korea due to its lingering nuclear issue" and this has prompted Pyongyang to "seek breakthroughs in diplomacy with countries like Russia, Japan and South Korea". The paper's editorial notes cooling China-North Korea ties, but dismisses speculations that "Pyongyang will lean to the side of the US in the end". "The key divergence between North Korea and China lies in the nuclear issue, but there are multiple conflicts among North Korea, South Korea, Japan and the US…The China-North Korea relationship is complicated. But China is still the most important and positive neighbour of North Korea. It is of irreplaceable strategic significance to Pyongyang," says the daily. Making a different observation, prominent political commentator Qiu Lin points out that North Korean officials had been making frequent trips to Europe and South Korea but not China. 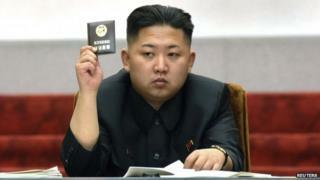 "North Korea's leader Kim Jong-un has not visited China since coming to power. This shows that his heart is not with Beijing… In other words, the country that Pyongyang is weary of is China, as they are unhappy with Beijing's warning over its nuclear programme," he writes. Meanwhile, papers in China continue to highlight economic repercussions of the protest in Hong Kong. Representatives of Hong Kong's pro-democracy protesters have agreed to hold formal talks with the government on Friday. Describing the street movement as "tyranny of minority", the China Daily warns that the "city's overall economic well-being could be more serious if disruptive protests continue for a longer period of time". "While Hong Kong bears the brunt of the negative impact of the city's street politics, the mainland economy could also be affected to some extent in the long-term, given the close economic ties between Hong Kong and the mainland," says the paper. It adds that the territory plays a bridging role "between the mainland and the external world, as well as a testing ground for financial reforms on the mainland". Urging the people in Hong Kong to protect its reputation as a financial hub, the Global Times adds that "some forces in Asia and the West" are "happy to see the chaos in Hong Kong". "The chaotic situation will create problems for China... For those who like to take pleasure in others' misfortune, this is a good thing sent from the sky," it says. And finally, state media praise the behaviour of Chinese tourists after the week-long National Day holiday ended on Tuesday. Foreign travel has become popular among China's affluent citizens, but their behaviour, like talking loudly in public and spitting, have been criticised in the past. Last year, China's National Tourism Administration published a special Guidebook to Civilised Tourism with an extensive list of dos and don'ts. This time, however, papers are reporting an improvement in the behaviour of Chinese citizens in foreign countries. The People's Daily points out that Chinese tourists are "observing the customs of the host countries" and their civilised behaviour has "won praises from foreigners". "Chinese tourists did not speak loudly, and stayed away from littering and spitting on the streets," writes a Tokyo-based reporter for the daily. "We represent China's image when we are overseas. Everyone of us has the responsibility to protect the image of our motherland," the paper quotes a Chinese tourist as saying.